Clophill | Where Angells Tread! My favourite walk for a while! Quiet Bedfordshire lanes, long views of The Chilterns, well-spaced villages for refreshments and the faded grandeur of a country estate…and no hills to speak of. We’ve started later than normal today (Hannah’s with us). It’s early afternoon before we park up in Clophill. Cotton wool clouds make a beautiful back drop to this walk and the temperature is cooler that it has been recently. 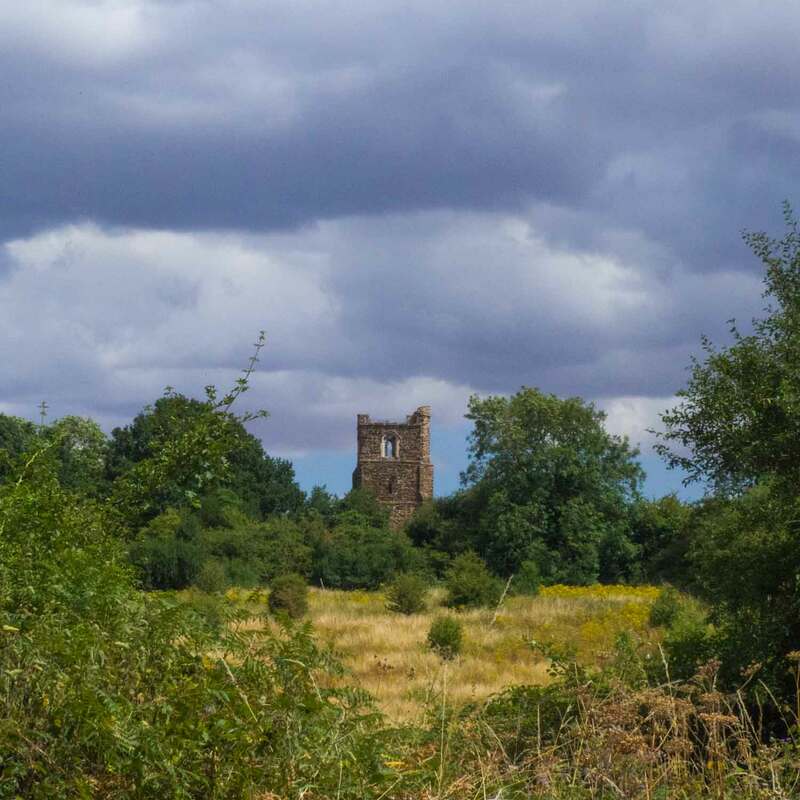 As we leave the village on the Greensand Ridge Walk we pass the ruin of St Mary’s. Lots of weird speculation about goings on here…some of it in bad taste. We don’t hang around. We skirt the disused quarry pits and the remains of the Cainhoe Castle by the A507. Looping through Upper Gravenhurst we follow the long straight path through Wrest Park before stopping off at Silsoe, once the home to an impressive 6 pubs along the High Street. Today it’s ice cream we need, not beer. We pass through Flitton, unaware it is the grand resting place of Henry de Grey, Duke of Kent and owner of the aforementioned Wrest Park…I have trouble enough getting value from our National Trust membership without English Heritage as well…and they seem to have fewer car parks…I think it would be a waste of money! By the time we pass through Maulden, where we re-join the Greensand Ridge Walk, it’s getting late. The skies have been getting steadily darker and eventually the long promised sharp shower arrives. As payback, we’re rewarded with a rainbow as we walk into Clophill. A good way to conclude a 13.4 mile walk, rounded off with an excellent take-away Chinese meal when we get home.